Armand Francouer ’65 COLA, Kay Ruma ’65 COLA, Colin Kelley ’12, Kevin Knarr ’91 and Emily Knarr at a UNH hockey game. Kevin Knarr ’91, chief operating officer of UnitedHealthcare Employer and Individual, part of the Fortune 500 UnitedHealth Group, understands the importance of giving back to his alma mater. In addition to supporting the building of Paul College and endowing two student scholarships, Knarr has given his time to the college in a variety of ways. He was a featured speaker at the former Whittemore School of Business and Economics Homecoming celebrations in 2010. Since 2011, he has served on the dean’s advisory board as a trusted advisor to former Dean Dan Innis and current Dean Deborah Merrill-Sands. And he mentors students and serves on various committees in the college. Knarr was recently invited to join the UNH Foundation Board, a prestigious honor reserved for the university's most committed donors. We caught up with Knarr, who resides in Washington, D.C., to find out what motivates him to stay so connected to the college. Paul College: Talk a little bit about your role on the dean’s advisory board. Knarr: I’ve participated on the board for the better part of six years, and I would say that the board, and my role, have evolved substantially over that time. What began as a forum to hear “report-outs” from the (at the time) WSBE administration has matured over time to a really productive environment of give and take, where board members are actively engaged in helping to advise on strategies and tactics, helping to shape the Paul College agenda. I credit Dean Merrill-Sands with being very open to engendering constructive discussion that leads to better solutions. One of my specific responsibilities in the coming year will be to lead the Business Engagement Committee in an effort to expand the universe of opportunities for both internships and careers. We will do this by opening more formal lines of communication with New England employers, whether or not they are headquartered in New England. Paul College: Are there other ways you stay engaged with the college? Why do you like to be involved with the college as an alumnus? Knarr: I try to take advantage of every opportunity to engage, especially when there are opportunities to interact directly with students, which is where I believe we have the greatest impact. I act as a formal mentor to students each year; I’ve taught “Intro to Business” as a guest lecturer; and I’ve helped evaluate candidates for the Internship Opportunity Fund. Each of these activities has given me unique insights into the student perspective, allowing me to draw on my own experiences to help counsel in a meaningful way. I feel I always come away richer for the experience. More broadly, I remain an avid fan and season ticket holder for UNH football and hockey, through thick and thin! Paul College: Is there a student you’ve had a particular impact on during your time as an alumnus? Knarr: I wouldn’t want to narrow it down to one student — I’d like to think that participating broadly over the years has allowed me to have an impact on several students. For instance, I was able to draw on my network to help a graduate from 2016 to make a connection to a senior partner at the global audit and tax firm where she would be working, enabling her to have a female mentor in support of learning how to balance career and life matters as she entered the workplace. I have been working with a 2017 graduate to help him better understand what to expect as he enters the management consulting workforce. Having endowed a scholarship for a student that matriculates from my high school, Bishop Guertin, each year, as well as a second scholarship for academic excellence, I am always pleased to get the chance to help offset the ever-increasing cost of higher education. Having the opportunity to meet these recipients also highlights for me the very direct impact our alumni can have. Paul College: Was there a UNH professor who made an impact on your career? Knarr: I would probably have to say (associate professor emerita) Rita Weathersby, who taught organizational behavior. After burying myself in the abstractions of my degree in economics, I began to dive into business administration courses toward the back end of my academic career. She was the first professor who was really able to bring the realities of the workplace environment to light for me, and gave me the confidence that the management consulting route was very much aligned with my career desires. It is fun to walk the halls at Paul College and see some of my professors still very engaged and passionate about their work. Getting to meet with (longtime economics faculty member and current associate dean of academic programs) Neil Niman in the context of a board meeting was a real treat for me. And one of these days, I look forward to revisiting the 1990-era in-class debates on globalization with (associate professor of economic development) Marc Herold, now that I’m armed with 26 years of actual experience! Paul College: Do you have any advice for other alumni who are interested in getting involved with the college? Knarr: It’s not just about financial participation. When I gave my first gift in support of the new building back in 2010, I made it clear that I wanted to have an impact over and above opening the checkbook. What I found was an incredibly receptive administration, looking for people to get involved in meaningful ways. There were so many ways to get engaged, and I was able to modulate my participation, from the outset, such that I could balance it with my workplace and family realities. I would recommend to all alumni to dip a toe in the water of involvement. I also find that the financial aspects of giving back are even more meaningful, as you see the tangible impacts you are having on the lives of the students. You feel those impacts as you get involved in nonfinancial ways as well. 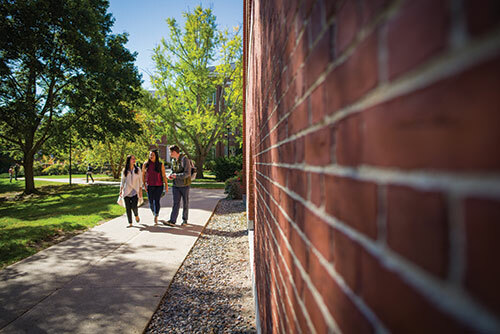 Paul College: Do you have a favorite UNH memory from your time as a student or alumnus? Knarr: Too many to count! Four years of great times at Sigma Alpha Epsilon; playing with my band, Mosquitos Don’t Drive, at places like Nick’s, Glory Daze, Benjamin’s and the Stone Church; hockey games at Lively Snively; road trips to Schneider, Conte, and Mathews; and racing with the cycling team. And I guess some school work here and there, though I wish I'd had the opportunity to take classes in the new Paul College building! As an alumnus, my biggest highlight has been introducing my Alabama-born, Auburn grad wife, Emily, to the basics of hockey!